Graco’s LubePro A4000 Pump from MotionSource is a reciprocating grease and oil pump to lubricate your machinery more efficiently, with more reliable pumping technology. Its pneumatic power makes it easy to install into existing airlines and allows you to extend your equipment life and improve efficiency. The LubePro A4000pump is an unfailing solution for output and constant lubrication cycles. The LubePro A4000 is the preferred solution for simple, injector-based automatic lubrication systems. Compatible GL-1, GL-1 X, GL-1 XL, GL-32, GL-33, GL-42 and GL-43 injectors, the LubePro A4000 pump is a flexible heavy-duty pump. With a pressure ratio of 40:1, the A4000 delivers a greater output than competitive models at .50 in per stroke. Plus, there is no wait like it’s Lincoln competitor, MotionSource has LubePro A4000 pumps in stock and ready to ship today. With a factory installed low-level available, the LubePro is engineered with high quality seals built to outperform it’s Lincoln competition. LubePro pumps leverage the same proven quality and leading technology as Graco Fireball pumps, proven in the industry for 60 years. In stock and an exact replacement for Lincoln Centro Matic pumps, right down to the bolt holes. A better engineered pump available today from Graco and MotionSource, not 10 weeks like the competition. 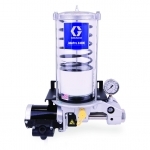 Need help with service or installation of your Graco G3 Pro pump? MotionSource has a 24/7 full-service team ready to help with what you need, when you need it. Our service technicians are Graco trained and certified to help with your pump needs. If you just need technical help, give us a call 888-963-6686. All of our customer support team is Graco trained as well. MotionSource is your Source for LubePro pumps!